Russian capital city has many iconic famous places. If you are traveling to this part of the country there are many things to explore. The must go place is the various famous landmark in the red square and their affordable tasty market. Moreover, Moscow offers many things, it is even a Muslim friendly country You can easily find famous mosques and halal restaurant here. Russian people and tourists can get by from place to place by the Russian trams and metro stations. If you are feeling to explore the city is affordable and luxurious way try the Russian metro. They expand throughout the city. Moreover, these stations will surely surprise anyone. In addition, their famous metro stations are another amazing places to look into. 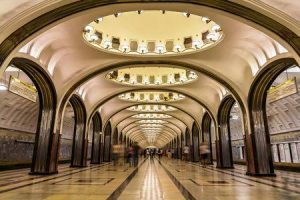 Theis metro systems go back in time during the Stalin era, decorated with the chandelier and extravagant trinkets. Metro serves as a great transportation also as a walking historical gallery. The Mayakovskaya Metro Station is a part of the Metro expansion and opened in the year 1938, September 11th. The two sets of thin colonnades in this metro station give an impression of additional space. This design gave birth to a new Deep column station type design therefore, this place has a very spacious feel. Even though, the platform is narrower compared to other stations. It is the first metro station in the world with this feature. The station also features stunning columns made of pink rhodonite, marble, stainless steel, and white Ufaley. In addition, the arches polished in stainless steel. It was the very first time designers use stainless steel for Moscow metro. Mayakovskaya spacious halls go down in history as a shelter in multiple occasions during World War II. In fact, even Stalin seeks to aid in this metro station from air raids. The metro station is a piece of art as well as a functioning bomb shelter. In addition, it surely did fulfill its purpose with 100 ft above the ground. The station is an excellent work Alexey Dushkin, a famous architect from Moscow. It is most well known for the 34 ceiling mosaics. It describes the “24 Hours in the Land of the Soviets.” Moreover, it is an important command post for Moscow’s anti-aircraft regiment during World War 2. They portray popular Soviet imagery with titles like Two Airplanes, Airship over the Spasskaya Tower, Grain Harvesting, and more. The design of the station receives an award from New York World’s Fair for the station remarkable design. The metro station is one of the world’s best-known metro stations. Moreover, it is most-photographed metro stations in Russia and serves as a symbol of the Metro system. Visitors and photographers will put this metro on top of their list due to its history and beauty. This metro station pictures is a common sight on covers of brochures and tour guides into to promote Moscow’s underground realm. in this station also held the anniversary celebrations of the Revolution in 1941. Stalin addressed the massive assembly of Soviet leaders and common citizens. The name is a tribute to the famous Russian poet Vladimir Mayakovsky. Moreover, the metro design is a reference to the poet prominent Soviet exponent. In addition, the metro holds a bust of the poet at the station. You can find it on the new surface vestibule. In this place, the ceiling also depicts a mosaic composition from Mayakovsky’s poem “Moscow Sky”. Futurism is a combination of art and social movement. It emphasized the speed, youth, and objects such as the car, the airplane, and the industrial city. Its long for modernity and aimed to liberate from the weight of its past. The art deco designer Alexey Nikolayevich Dushkin made these artworks envision on the poet works. However, his work in the stations drawn criticized. Many thought they are inadequately small for the spacious station and awkwardly hidden around the halls. Later on, Dushkin himself reveals that many works can improve the metro station decorations. The world famous Mayakovskaya station continue to have several constructions. It opening the second exit line in 2005. It also receives some improvement is escalators and replace the old ceramic tiles with aluminum planes. Russian government gives much thought to this old yet masterpiece station. The metro stations are one of the stations in, formerly Gorkovsko–Zamoskvoretskaya. A line of the Moscow Metro. There are 23 stations on the Zamoskvoretskaya line, on if them is Mayakovskaya and it spans 42 kilometers crossing Moscow in a north-south direction. This station lies between “Belorusskaya” and “Tverskaya” stations. A normal trip the entire line takes about 55 minutes, with the average trains speed of 42 kilometres per hour. Most of the line is underground, with pockets of surface-level or above-ground track, especially where the line crosses the Moskva River. Mayakovskaya metro station is in the central part of the city. It is an approximately 2.3 kilometers away from Red Square and the Kremlin to north-west part. Moreover, it is at the intersection of the “Sadovoye Koltso” and Tverskaya Street. Some of the busiest and crowded street in Moscow. You can enjoy the Moscow street style among these streets. This station lies between stations “Belorusskaya” and “Tverskaya”. It is one of the most beautiful stations of the Moscow Metro. This particular Moscow Metro Station serves as station and also as the largest underground museum. Mayakovskaya Metro Station is a luxuriously Soviet design influence by Stalinist Empire. It represents the time when communist rule the country. Moreover, when the tsars can enjoy every luxury there are no reasons their citizens cant have glimpses of it.